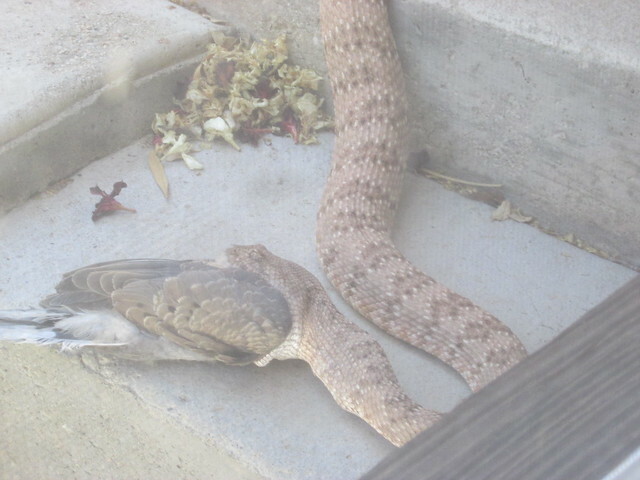 This is an interesting National Geographic article about the Southern Pacific rattlesnakes on the Idyllwild side of Mt. San Jacinto which have more dangerous venom than the same species in the desert. Watch out! Interesting. It mentions some "rubbish" news articles. I may have read one of those in the past. Distribution of toxin not known; absent from C. m. pyrrhus in U.S.
thought i'd share some more pics of my local variation of the Southwestern Speckled. 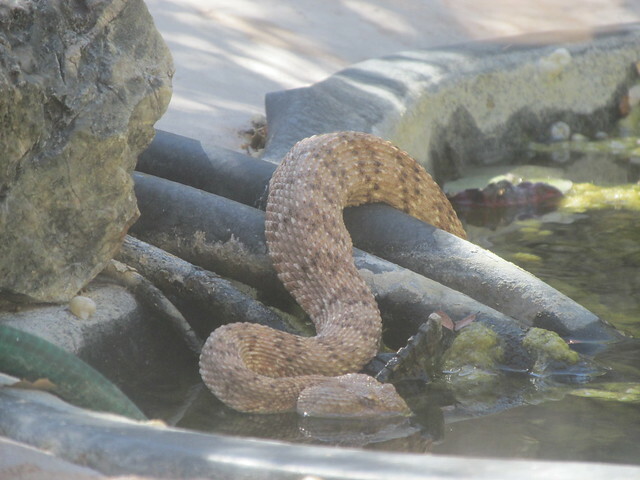 when it's hot they go for a dip and a gigantic drink of water like 1-2 minutes! it took several attempts, at one point the dove beak was almost sticking out his skin. dude(tte) was stuffed and I thought that would last a few weeks but back out hunting the next 3 days! beachmaster spent 1/2 the summer on point....yes bunny you smell something dangerous! Pi, I had thought perhaps that was really a Red Diamond, but after looking it up I think you're right, it does look like a variation of the Speckled. The reddish ones sure look similar, with the Speckled having more of a stripy look than a diamondy look. Perry wrote: Pi, I had thought perhaps that was really a Red Diamond, but after looking it up I think you're right, it does look like a variation of the Speckled. yup, i spent 17 years figuring it out. i have a friend/biologist and they say the variations in snakes is amazing! otherwise there are no other color rocks for them to have adapted to, or forest for that matter. evidently not as painful bite as black widow spider bites.... from a numskull i know that's been bitten by both! IT'S HOT......i'm ready for cooler weather...hottest darn summer yet!!!! Let the summer be over, RIP summer 2018!!! 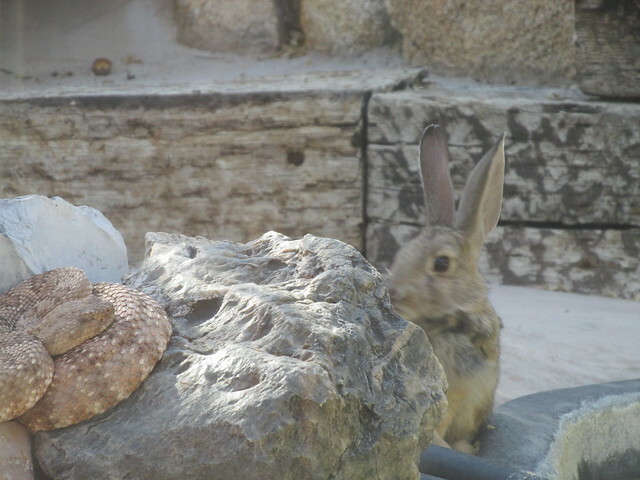 Nice pics Pi, those bunnies are pretty tough, it seems, (like the squirrels, (beechy ground Sq?) that are immune, (the theory being it's an arms race to out-compete each other). Love that shot of the shot of the rabbit who realizes he's in striking distance, (they may be fast, but so it a rattler strike). I hadn't noticed how much more pronounced the "coontail" is on the Red Diamond, (thanks for the links Perry). Interesting how much they can drink, just like how much air their lungs seem to hold. I was in JT a few years back, cool & windy, (not good snake conditions), and while sitting on a few small rocks, I kept hearing a long, sustained "hissing-type" sound. 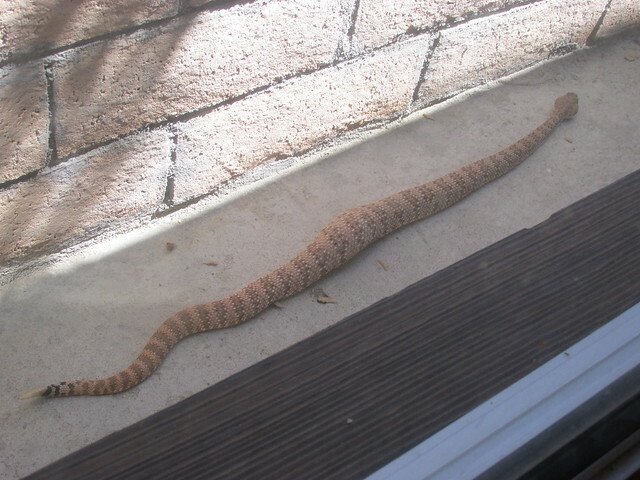 I kept thinking it was the wind, until I looked down a bit, and wedged at the bottom was a large Mojave Green, giving me the warning hiss, I guess, pretty eerie, (he never did rattle, too cold maybe). Yesterday on my bike ride up Whitewater Canyon I spotted a long Red Racer, in their typical stance of it's head a foot off the ground for better visibility.